Long time no post! If you follow me on Instagram you'll know I've been really busy with my own business ventures so it's taken most of my time in addition to working a full 9-5 job. However, that doesn't mean I haven't been trying my fair share of beauty products! I got a sample of the Jouviance Coconut Melting Balm about six months ago and have basically been applying it every day, especially since I've gotten myself slightly more tanned (or burnt?) over the summer. It's one of those products that only has five ingredients, is seriously hydrating, smells divine, and can be used as a multifunctional product for almost all of your skincare needs. If you aren't already familiar with Jouviance, I wrote about their Contour+ a few months ago and it's one of my favourite products. All of their products don't contain any parabens, sulphates, phthalates, mineral oils, colours, or artificial fragrances. In short, their products are unlikely to irritate your skin and actually work. 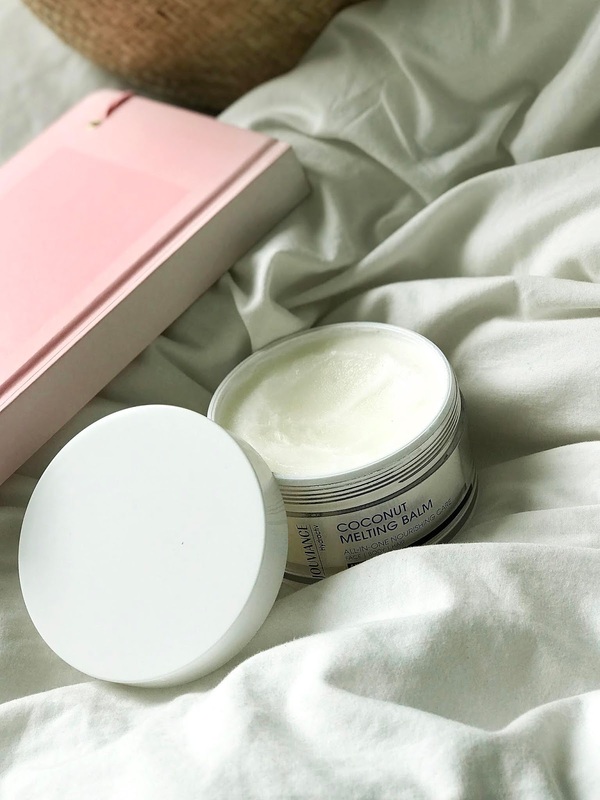 The Coconut Melting Balm has been my go-to every night after the shower, and as mentioned above, it's made from only Coconut Oil and Hyaluronic Acid. We all know how amazing coconut oil is for the skin, so this product basically has all of the benefits of the oil itself PLUS the benefits of hyaluronic acid. In addition to its hydration factor, coconut oil has a whole set of other great properties. Firstly, it's an anti-inflammatory due to the high concentration of fatty acids. Coconut oil doesn't just sit on the skin, but it soaks in deep to the skin to improve the hydrolipid balance. It's a great makeup remover, and it's also anti-microbial, making it highly beneficial for those who have cases of dermatitis and psoriasis. Body Moisturizer. Since the main ingredient in this balm is coconut oil, it melts super easily and a little goes a long way. I love applying it before I go to bed right after I get out of the shower and my skin feels so smooth the next morning. Hair Conditioner. I have dyed and bleached ends, so my hair is dry and brittle. There's two ways I like to use this balm for my hair. Firstly, I'll either use it as a hair mask when I'm taking a bath, or as a smoothing oil when my hair feels a little frizzy. Overnight mask. Coconut oil will not clog your pores, so on some nights I'll put on a thick layer before bed and I'll wake up to the freshest face ever. In addition to the ways I like to use the Coconut Melting Balm, you can also use it as a lip mask, hair serum, belly balm, and baby butter! It's perfect when you want a simple routine, or for travel when you don't want to pack too many products. You can find the Jouviance Coconut Melting Balm on their website as well as Shoppers Drug Mart. 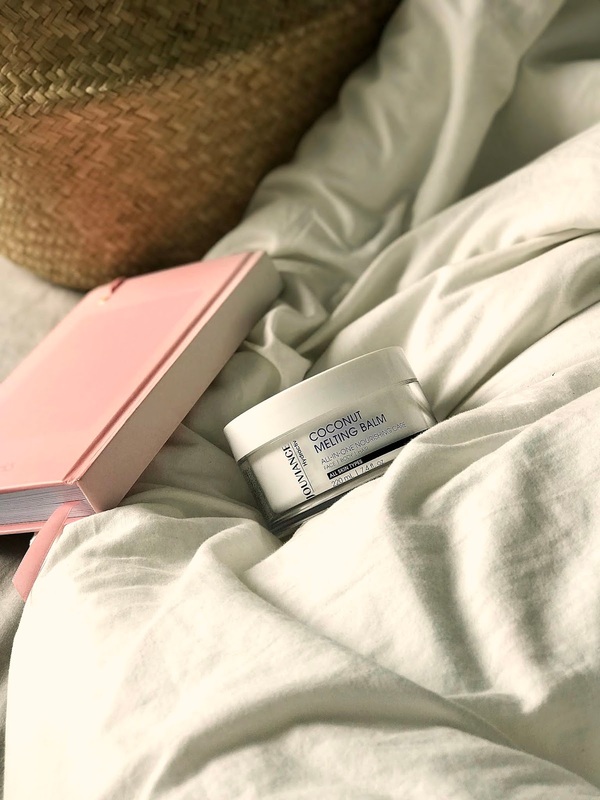 I hope you all enjoyed reading this super lengthy post, but I really do love the Coconut Melting Balm, and I really wanted to share my opinion on it with all of you! Disclaimer* Press sample sent for consideration however, all opinions are truthful and my own.